It is time to get some facts straight about Ferrari maintenance costs. The myths about $1000 oil changes and $20,000 clutch replacements seem to plague the internet and car forums. Can repair bills get high, well of course they can. Engine and transmission rebuilds, improperly maintained vehicles that need to be brought back onto schedule, can all run well into the five figure category. The point of this article is not about those big ticket items, it is for the everyday Ferrari maintenance that goes along with regular ownership. Oil and belt changes, brake pad replacement, annual services, things like that. 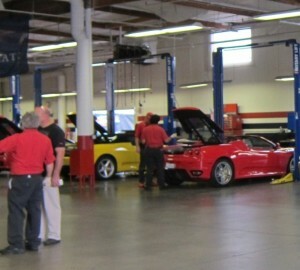 A properly maintained Ferrari can give you years of problem free ownership. Is that to say that there can’t be a lemon in a group? Of course not, but even Toyota and GM are haunted by service bulletins and recalls. A Ferrari is not magic derived from a powerful wizard and unicorns, it’s a car. It has an internal combustion engine and a transmission. Take care of it like any other car and it will last longer with less problems. Drive the hell out of it and it will require more service. dealer (Ferrari of Ft. Lauderdale to be specific). These are not made up numbers, in fact, feel free to give them a call and verify the information (954) 607-7942 or visit the link under the chart to check out their website. In fact, they have even been known to have $99 oil change events (they book up fast!) This goes to show that yes, service costs are a little more, but not much more. You could even find a solid independent Ferrari mechanic and get some of these done for a little less. With that said, do your homework and get references before entrusting your pony to an independent tech. Even better, is that if you are mechanically inclined, there are many Ferrari maintenance services that you can do yourself, costing you even less! Also, service intervals can be argued about. One in particular is the amount of time between oil changes. Many stick to the 3,000 mile interval, but others argue with modern synthetic oils and the sheer amount of oil (12 quarts for example, in the 348 & 360) that you can go 5,000-7,500 miles with no problems what so ever. This is up to you of course. Do your own research and decide for yourself (www.FerrariChat.com is a great forum for more info and research). We feel better now that the myths have been cleared up and folks can get back to enjoying a Ferrari, while worrying just a little less. ** The 348 changed from a double disc clutch to a single disc clutch sometime between its 1991-1992 production. The single disc variety costs less for a replacement than the earlier double disc versions. Visit Ferrari Maserati of Fort Lauderdale’s website for more information.